For families looking to escape the UK over May half-term, Efteling – the fairytale theme park in the south of Holland – has launched an exclusive early bird offer valid on all bookings made until 17 February 2019. With its unique storybook atmosphere, natural surroundings and a wide range of enchanting attractions, thrilling rides and captivating shows, Efteling is the complete antidote to traditional theme parks and offers a little something for everyone to enjoy. Thrill-seekers will love riding Efteling’s famous rollercoasters such as the infamous dive coaster Baron 1898 and the double track wooden Joris en de Draak – guaranteed to give visitors an adrenaline rush. For something a little calmer, Efteling offers a number of indoor dark rides including Fata Morgana, a boat journey passing through scenes from the Far East, and Droomvlucht, which tells the story of a dream world where unicorns and forest animals come to life. Younger visitors will adore taking a stroll through Efteling’s famous Fairytale Forest, home to fairytale classics including Cinderella, Sleeping Beauty and Pinocchio, as well as taking a ride on the park’s monorail that skirts the treetops in Laafland – where Efteling’s humorous Laaf people live. Efteling’s must-see shows will captivate visitors of all ages, particularly the new international show CARO, featuring stunning visuals, dancers, music, acrobats, and special interactive roles for the younger visitors. Efteling’s accommodation options located within walking distance of the park are perfect for those who want to relax on-site after a long day of fairytale fun. These include: the Efteling Hotel, Holiday Village Efteling Loonsche Land, Holiday Village Efteling Bosrjik and Holiday Village Efteling Loonsche Land Hotel. The Early Bird offer is valid on all bookings made until 17 February 2019, for travel within a minimum of 120 days of the date of the booking. The price of a one night stay in the Holiday Village Efteling Loonsche Land Hotel based on two adults and two children sharing a room with the Early Bird offer is priced from €297,50 (from €350) including two day entrance to the park and breakfast, excluding booking costs and tourist tax. Efteling is easily accessible in a few hours from most of the UK with ferry, Eurotunnel, Eurostar and flight options. Since the opening in 1952, more than 130 million visitors have experienced an unforgettable day at Efteling, in the south of Holland. Over the years, Efteling has grown to become one of Europe’s biggest theme parks, with a unique fairytale atmosphere, natural surroundings and a wide range of thrilling attractions. It is now ranked in the top 25 theme parks in the world, according to the Tea Theme Index 2016. 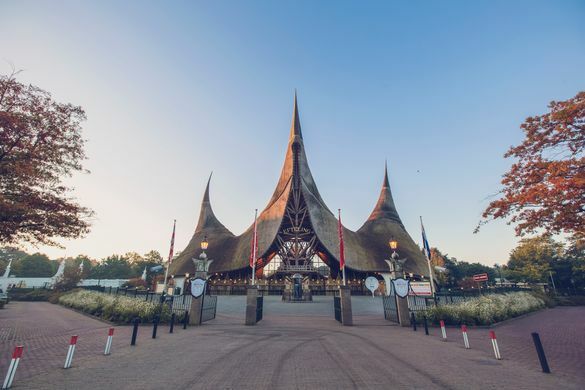 Efteling is open all year round, and is an ideal family short-break destination with the Efteling Hotel and the holiday parks Efteling Bosrijk and Efteling Loonsche Land just a stone’s throw away. Through a programme of phased growth over the coming years, Efteling aims to become an international destination with five million visitors per year by 2020. Efteling is represented by LOTUS in the UK. Please contact Jules Ugo, Georgina Oakley or Lucy Keenan at jules@wearelotus.co.uk / georgina@wearelotus.co.uk / lucy@wearelotus.co.uk or call the office on 0207 953 7470.